Despite sounding completely unrelated, “chickpeas” and “garbanzo beans” both refer to the same type of bean, so choosing between these two terms just boils down to personal preferences. This article provides essential information about this popular ingredient. In the food industry, chickpeas (Cicer arietinum) go by the following names: garbanzo beans, garbanzos, Egyptian peas and ceci beans. Although they all sound different, they refer to the same protein-rich beans that belong to the Fabaceae family. According to studies, chickpeas have been grown in the Middle East for around 10,000 years, making it one of the oldest legumes to be cultivated. In the earliest years, however, the plant carried different names across varying regions, which explains why it has a diverse naming scheme. The English term “chickpeas” was coined from the French word chiche, which was derived from the Latin cicer. The word “garbanzo,” on the other hand, is the Spanish term for the plant. It is mainly used in areas with a strong Spanish or Mexican influence. As a plant, chickpeas are distinct for their tiny, feathery leaves. Upon maturity, the plant grows into tiny seedpods that carry around 2 or 3 seeds. The plant’s flowers are unique for their pink, blue or violet veins. Furthermore, although chickpeas refer to the same legume, it is classified into two different types: the Desi and the Kabuli. The Desi, which means “native” or “local,” is a small, circular, rough-coated bean widely cultivated in Mexico, India, Iran and Ethiopia. As compared to the Kabuli, the Desi is jam-packed with higher levels of fiber, nutrients and antioxidants such as myricetin, quercetin and kaempferol. The Kabuli, by contrast, is a large, light-colored seed that has a smooth coating. It is common in Afghanistan, Europe, North Africa, Chile and Pakistan and it is also a rich source of nutrients. As a cooking ingredient, chickpeas are popular for their rich, nutty flavor. Aside from strengthening the flavor profile of famous Indian and Middle Eastern recipes, they also contain around 20% of the Recommended Daily Intake (RDI) of protein, fiber, folate and zinc, along with essential minerals such as calcium, iron, zinc and magnesium. Similarly, chickpeas are a great addition to the human diet as they boost the feeling of satiety, which in turn lessens a person’s overall food consumption. Plus, since chickpeas are rich in antioxidants, they help clean the colon and regulate blood flow and cholesterol levels, making one less susceptible to cardiovascular diseases. In terms of serving and nutritional content, 100 grams of cooked chickpeas (which is made up of about 60% water, 9% protein, 27% carbohydrates and 3% fat) contains around 164 kcal. Once cooked, the protein quality of this nutrient-dense bean intensifies, along with its digestibility. Lastly, in the market, chickpeas are mostly available in two forms: canned and dried. While the canned version is ready for cooking or consumption, dried chickpeas still have their hulls intact. To prepare the dried version, the hulls should be removed and the chickpeas should be soaked overnight in water. Since English and Spanish speakers live in many neighborhoods, the terms “chickpeas” and “garbanzo beans” are frequently used interchangeably. 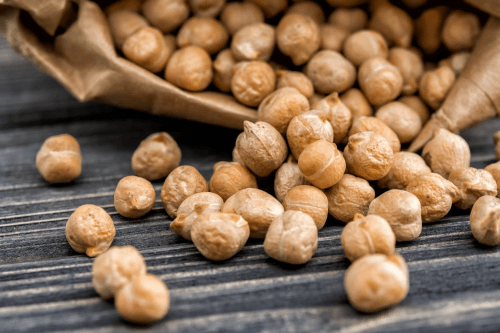 Despite the confusing terminologies, there is absolutely no difference between chickpeas and garbanzo beans as they refer to the same protein-rich bean.